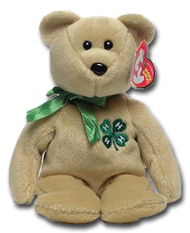 In 2004 through 2006, in keeping with the Beanie Babies craze which was sweeping across the collectors’ world, Ty Beanie Babies produced “Clover, the 4-H Bear” as a 4-H Exclusive, sold only through the 4-H Mall (not at retail stores) and as an internet exclusive. 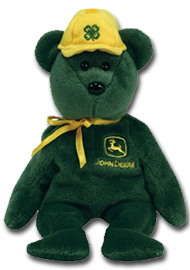 The toy bear featured the bright green and white 4-H emblem on its chest and a matching green ribbon tied in a bow around its neck. A Ty paper tag is affixed to the left ear. Inside the tag reads: “Clover, Date of birth October 2, 2004, Heads together to think things through, Hands that will work hard for you, Healthy living that we share, Hearts that show how much we care.” The Beanie stands approximately 8 ½ inches tall. The bear was available in gold fur, white fur, and tan fur. This entry was posted in National Compendium of 4-H Promotion and Visibility and tagged Beanie Babies by Larry Krug. Bookmark the permalink.